The author is concerned with media freedoms and human rights, and here deals with several of the challenges which have been made to any reasonable flow of information - in one compact volume. 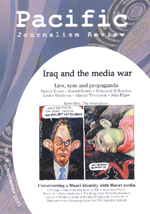 BRISBANE: David Robie has written a compendium on media and journalism in the South Pacific pointing out the strengths of free-spirited journalism and the dangers of politically-motivated media control. His main focus is on the two main countries Fiji and Papua New Guinea, leaving out the third major focus, the French Pacific territories. It is a strength of this book that it is a monograph; one mans expert, thought-out treatment of the subject, which is consistent, well-documented, open, thorough - definitive. Mekim Nius gives a history of news media in the Pacific countries to describe and explain current practices and problems. Robie is well placed; a well-know, well-reputed New Zealand journalist and lecturer who has headed the journalism programs at both the University of the South Pacific - Fiji (USP), and the University of Papua New Guinea (UPNG). He is concerned with media freedoms and human rights, and here deals with several of the challenges which have been made to any reasonable flow of information, in one compact volume. These include the Fiji coups detat, acts of intimidation against journalists and publishers in different countries, and threats of state censorship by political leaders in Papua New Guinea and elsewhere - not least harassment of media in Tonga. He recounts the efforts of university authorities to cut back the activities of their journalism schools, against a background of danger and disturbance: deteriorating law and order, and police indiscipline in manhandling protestors at Port Moresby; the second military coup in Suva. Other issues dealt with are more universal: the applicability of ethics in all circumstances, trends to professionalisation in journalism, and professional preparation in universities and the workplace. 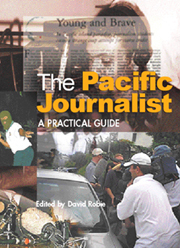 The problems of journalism are matched in the book against the general state of democratic government in the Pacific states, producing a well-reasoned verdict that while a free media tradition is sustainable it is hampered by dire social and economic circumstances. One interesting theme, and possible pointer for the future, is the idea of the "Pacific Way" for doing journalism. In this system of amalgamated priorities, freedom of thought and freedom of information are defended as universal values; development issues are emphasised; and very importantly the interplay of cultural factors must be taken into account. Therefore the place of chiefs in Fijian society, and the way the wantok system determines communal loyalties in Papua New Guinea will be reflected in how the news agenda is set and in the style of reportage. Language is another key consideration. English is the main language of most media outlets, but used only by a minority, e.g. 19 percent of Fijians identify it as their first language, 16 percent of Papua New Guineans. It will continue in use for the formal business economy, for elite populations able to buy media products and support the advertisers, but this leaves a void and starts a debate about alternatives. In Fiji, the task is clouded by the slow process of normalisation after the second coup. For Papua New Guinea the example is given of the weekly newspaper Wantok, published in tok pisin, PNGs main language spoken by 41 percent of the population. Owned by a churches consortium its a pictorial covering a range of community concerns from the HIV-AIDS crisis, to regional festivals, development news and sport. Its circulation is about 7000 but, as Robie observes, quoting a report on PNG media, "by the light of kerosene lamps all over PNG it is the most listened to paper in the country". Other initiatives for change include the current AusAID initiative to revive the national radio service, radio being identified as by far the most-used media; and as the author points out, the absence of a national news agency is an obvious area where the information gap may be filled. 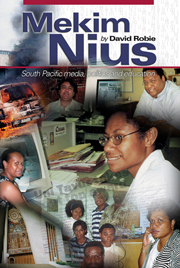 * Mekim Nius: South Pacific media, politics and education, by David Robie. Suva: University of the South Pacific, 2004. US$20. David Robie is an Associate Professor in the School of Communication Studies, at Auckland University of Technology.